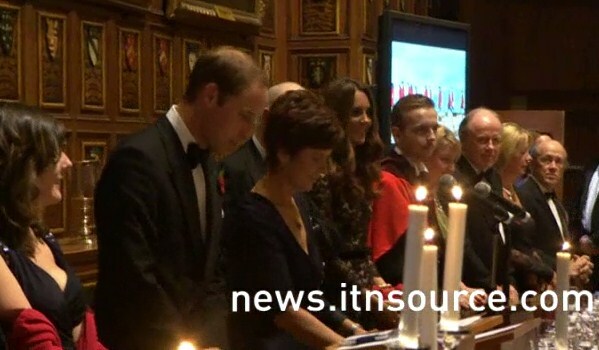 The Duke and Duchess of Cambridge attended a black tie fundraiser in Middle Temple Hall, London in support of St Andrews University's 600th Anniversary Campaign. The couple were greeted upon arrival by a St Andrews representative and a large media presence. You may recall the Cambridges visited Middle Temple on October 8 to meet law students. Reporter David Wilkinson kindly shared this photo from inside the picturesque hall. 'I never thought that going to university would be an option for me. However, I was selected to take part in the First Chances project which gave me more confidence in my academic abilities." St Andrews is consistently ranked among the UK's top ten universities and has an international reputation for delivering high quality teaching and research and student satisfaction. I'm sure you all remember the public launch of the 600th anniversary campaign by its patron Prince William in February 2011. The campaign will run until 2016 and aims to secure £100 million to support a range of projects and aspirational new developments. If you wish to donate you can do so by clicking here. 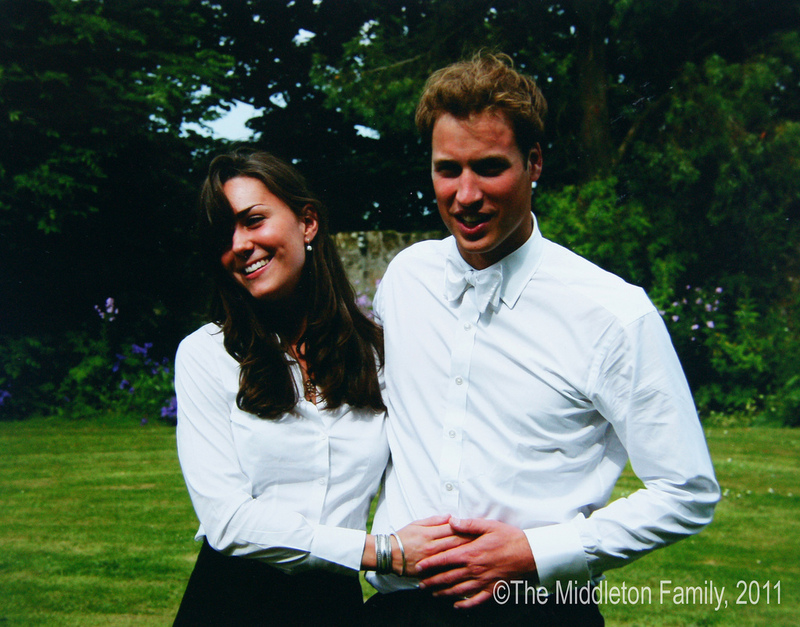 St Andrews holds a very special place in William and Kate's hearts. The couple first met there and fell in love as first year students and both graduated in 2005. 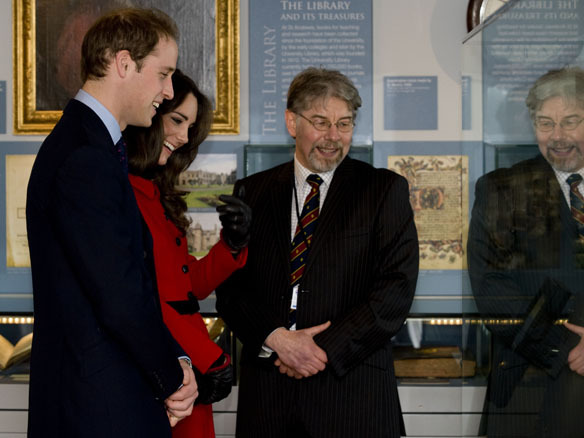 William with an honours degree in Geography and Kate with an honours degree in History of Art. Prince William recalled memories of falling asleep during lectures at St Andrews. 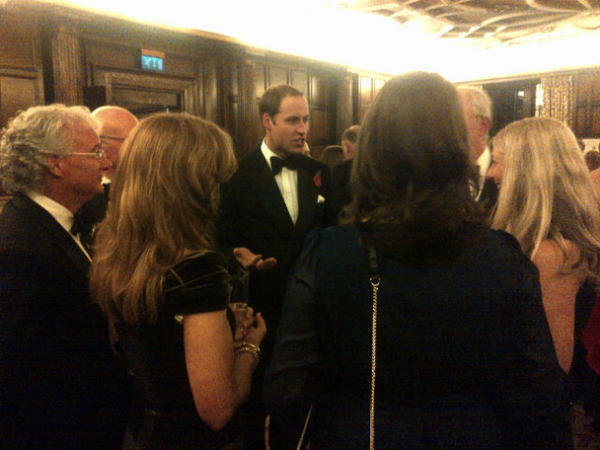 During his speech Prince William thanked St Andrews for the friendships it brought him, including the woman he loves. "As I look around the hall tonight - even take a peek at the person sitting 3 from my left - I thank God for those friendships". 'I hope you weren't involved in the fashion show, you never know what you are going to be asked to wear!'. 'If we had asked for that picture of us hugging we wouldn't have got it. It was just very natural and summed up how unbelievably happy we were'. 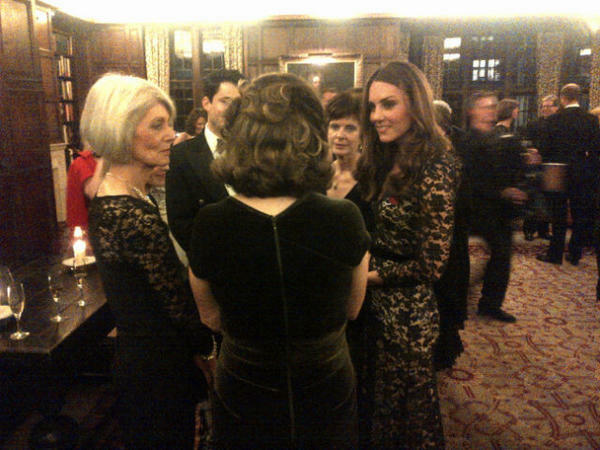 Kate chatting with guests at the reception. Also in attendance were Principal and Vice-Chancellor Professor Louise Richardson, Chancellor Sir Menzies Campbell and Senior Governor Ewan Brown together with over 250 alumni and friends. Entertainment was provided by The Other Guys, a student a capella group who became a Youtube sensation with their spoof musical tribute Royal Romance, as well as a violinist. The menu included spiced poached pear with roquefort, crown of partridge and rhubarb and ginger crumble washed down with a Middle Temple Claret 2009, a University of St Andrews Bruichladdich single malt. There was also a silent auction which included a lot of Robert Burns books and excursions such as the Ultimate Safari Adventure. Duchess Kate recycled the Temperley Amoret Dress she wore to the War Horse premiere in January. I had not expected Kate would recycle for the black tie event but the Amoret is a stunning piece and certainly deserved another outing. What do you all think? Were you hoping to see something new? Kate wore her Large Crystal Buckley Poppy Brooch which is available here for £25 (with thanks to the amazing Anna) and carried her red Alexander McQueen clutch bag. I thought it a nice touch to colour coordinate the two. 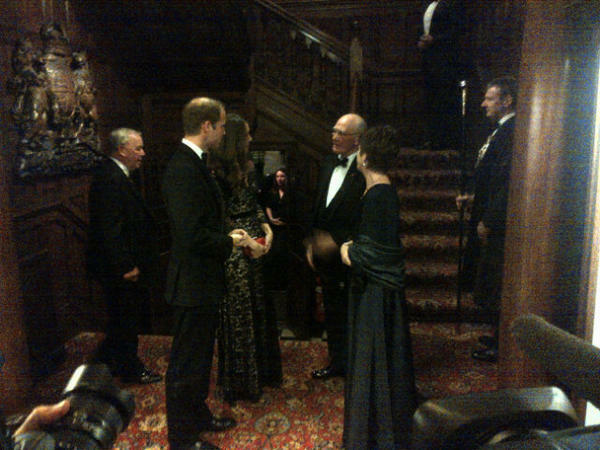 The Duchess chose her Jimmy Choos Cosmic Pumps for the event. The suede pumps are available for €525 (with thanks to @MrsRegalEyes for spotting them) The Duchess also wore her Annoushka pearls. A number of you mentioned how good you thought Kate's hair looked tonight. Very sleek and shiny. You can watch a video from the event at ITN Source. In other news, Kate's patronage East Anglia's Children's Hospices shared a message from the Duchess in a lovely video. We will next see Kate on Sunday for Remembrance Day events which take place at 11 a.m. I was hoping for something new, but it makes sense for her to recycle such a costly garment. Can't wait for more pictures. Thanks for the quick update! I'm kinda disappointed now... I was expecting a new and fabulous dress! But instead, we have an old and fabulous one! This is one of my favourite dresses of all time! It is so stunning that would be a shame to wear it just once! Thank you for this quick and great post! I completely agree! A little sad to see a repeat, but it's an amazing one so we really can't complain. But I especially agree about the hair - it would have been nice to see something different to distinguish it from the other time. But I agree with you that she could have do with her hair different...but anyway it's a really fabulous dress! I said I was disappointed when I first saw the dress again, BUT it would be a shame to leave such a stunning dress in your closet just because you wore it once, a while ago. This is one of my top 3 favorite dresses she has worn - she looks beautiful. I love this dress, I think she looks great! I also love how she matches her red clutch with the poppy! I love that she wears the same outfits several times, we all do it & it makes me feel like she is a bit more normal than she could be, given her status. This dress is beautiful & the red poppy and clutch make a striking combination. I always appreciate when she 'recycles'. Diana almost always wore her dresses more than once. I'm looking forward to seeing the pink Jenny Packham from the Ark gala last year. That said, I never liked this dress and I like it even less with the red accessories. Once again, she couldn't be bothered to style her hair away from her face. I love the Jenny Packham gown too and I hope we see it soon. I think this black gown would look better (IMO!) if the whole thing didn't have the sheer quality to it...maybe just the sleeves and above the chest, with the body being black lace over black. I love Kate's hair, but I agree with you Robert. she needs todo something else with it. a nice updue or half up would make a big difference! First off, I love your blog - I read every time you post! Secondly, I'm also a bit disappointed she recycled this in the way she did. If I owned this dress (and could fit into it properly the way she does LOL), granted, I would try to wear it as much as I could too - - but maybe changing up here hair (like an updo! )or adding some notable accessory would make the 'recycle' different than the last time she wore it. Of course last year she had a lot of new and beautiful evening dresses, because in her new position she needed different clothes, so it is to be expected that she will wear them again and this is one of my favourites. I love this dress and she looks beautiful and I like that she matched her clutch to her poppy. I love everything about it!! Wonderful sense of occasion! Enjoy your evening! That is a great cause! Truly a unique flower in the world! Ok, I know this is going to be met with some criticism and I have NEVER been one to suggest this before, but- in the second picture there is the slightest pooch in addition to yesterday's outing when she kept her hand over her belt buckle-area, plus the comments that she looks like she is filling out finally. I think that announcement may be coming sooner rather than later! Louise- I have looked at other pictures of the Duchess lately and she has "filled" out and looking really good. I too noticed her with the hand covering her tummy area on Wednesday evening. I wonder too if an announcement will be coming around Christmas time. We can only hope. As a sewer the visible seam in that dress is like chalk on a blackboard, once I get past that she looks lovely. I am not surprised about the dress as this this really a fund raising event not a film premier. It would be nice to see the cost of a dress donated to the fund by the Cambridges. I think it's great she recycles,even at a black tie event. I think it's nice that she shows the dress off to others not just one group of people. Its like giving people a second chance to admire the dress in the full glory not just in newspapers or the Internet. Not just gives the people a chance to admire the dress again but if one likes how a dress looks and feels then it's a shame not to wear it again. It helps set style as well as statement. It's a practical choice to recycle, but I'm still surprised, given the type of event. Do you know if queen has ever recycled for a formal event? I know she's not the queen consort just yet, but just curious what the precedent was. The Queen "recycles" all the time--I believe the dress she wore for the state dinner last week, she has worn more than once. Sophie Countess of Wessex at the State dinner wore the dress she had worn a few weeks before for the "Eve of wedding" dinner in Luxembourg. In my opinion Catherine looks better in it tonight,as she has put on a little weight. I think the people who are surprised that she recycled for a formal event aren't too familiar with the royals. That fabulous Elvis dress was worn by Diana three times, she wore the "John Travolta" dress twice, and so on and so forth. And yes, the Queen does this too. There is nothing new about what Kate is doing. It is simply about time. Yes, the Queen recycles all the time. The primrose yellow dress, coat and hat that she wore for Will and Kate's wedding also made appearances on her tour of Australia and at the Trooping of the Color this year, all quite high profile events. 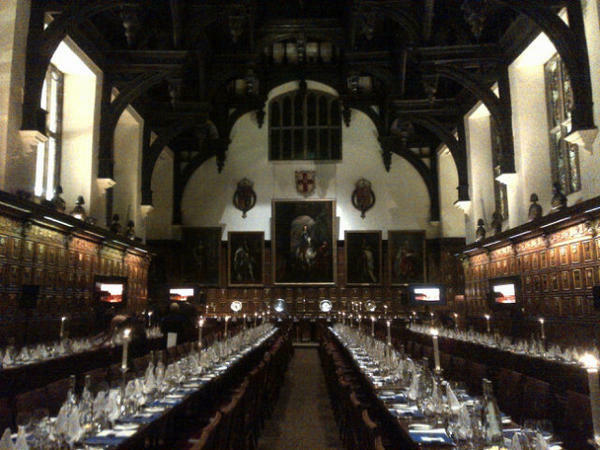 Oh my, I was in Middle temple this summer, during the olympics, it was the Belgium house and I remember how I marvelled at the gorgeous building. I was looking at these pics and something looked vagely familiar... the coat of arms in the wooden panels where W and K are being greeted and I thought "Wait, Ive been here!". Its a gorgeous building. I don't mind if she recycles. She is the flower of the UK and to me, always beautiful! I'm glad to hear you feel better dear Charlotte. Keep warm! Absolutely perfect tonight ! The Duchess is quite right to recycle, and that dress is wonderful. I think the red clutch chosen because of the poppy is a delightful touch. I also love her hair and make-up, though I do agree she could have worn it up or half-up to change a bit from last time. She looks gorgeous and so very happy... Prince William's speech was lovely too. Personally, I think it was a classy move to recycle for an engagement at their university. She's already going back as a future Queen of England :) so there's really no need make an even grander entrance. LOL. And I think the poppy and red clutch was a nice touch and a fitting contrast for a black gown. Not just fitting to accessorize the gown, but almost a must for Br. Royalty to keep on in this month to show support for Remembrance Day. It's as much a hallmark statement to wear the poppy as it is to see US statesmen wearing a US flag pin. I noticed the current tour Prince Phillip and Duchess of Cornwall are on in Australia - they also each are being photoed with their poppy pins on currently. It's ok that she recycles, but she should have changed her hairstyle. Kate has very beautiful face features that are enhanced when she makes a chignon! Ditto - a chignon would have been beautiful and really set this dress off well. This question is off topic. I read that Kate smokes and she is very careful to not be photographed in public while she is smoking. What do you think Charlotte? Is it true that the Duchess smokes? I have no idea whether Kate smokes or not. There have been rumours but I haven't seen anything to confirm it. I have seen candid shots of her when she was not married yet smoking in clubs and a few other shots. Nothing I have seen since the engagement was announced have shown her smoking. It was talked that she did smoke a lot (rumored to be part of her dramatic weight loss from 2005 univ. graduation to engagement and wedding when we all noticed how much weight she did loose. She almost looks like she had face surgery having lost that baby fat she had in 2005-07 still and none of it shows now - never been sure if that was totally due to weight loss or if she did have something done to help along with the loss of that baby face she did have. Some comes with aging - but then weight loose, aging and her rise in status, she might have had some very top job work done has been in the back of my mind. I would hate if she smoked! especially if is trying to get pregnant! Really? I have been a royal watcher for many years and have NEVER seen a picture of her taking an actual puff of a cigarette. The best we had was a pic of a cigarette pack in her purse once. If anyone has the actual photo, please send it my way. It's a rumour that has been circling for ages, with no actual proof. In my opinion, she's a social smoker at best, but most likely not at all. P.S. A Royal aide recently told the Telegraph that Kate has never been a smoker. I read in a magazine that she was spotted smoking at the airport in France and she was afraid of the Queen see these photos because she had promised to quit after marriage. So many lies every day about them, how to know the truth? Ditto on her hair - she so needs some new updos and even if she had worn it part up and back with some down would have helped a lot. She so often is hidden in her profile and even full on front photos by her hair in the way. She has lovely hair, but it's gotten too long and she is out of place at a black tie evening affair like this with it down and loose. She needs to find some loose updos that work for her so she is not going to feel it's a dramatic statement to put her hair up. I would love to work with her hair = it has so many possibilities. Siddhii -you can find it on you tube. It is very sweet. I agree with some of you gals about an updo for Kate's hair but like Jean from Lancs said she has plenty of time to do the style change thing. She probably will always keep it about the same length as her mum when she gets older. Ha that's my guess. Have a great weekend to all. I think we would always like to see something new, but this is a lovely dress and actually this is a proper event to recycle a dress. I would like to see her hair swept up or back more often. Though, if I had long flowing glossy locks like her I might want to wear it down and flowing all the time too! I also would have liked to have seen her hair in a swept back do here (and more often) = the lenght her hair is gotten to now is really super long and only is appropriate to wear down for less formal affairs then this event was. I have no problem with her wearing this dress again, but I wish she'd add a new touch to it, like a different color belt or something, just to make it feel refreshed. Also - she clearly still fits in it perfectly... so she is the same size as last year. Guess there is no baby bump, yet. You know, I really didn't like this dress the first time I saw it. But paired with a red clutch and a red poppy... it's... kind of pretty!!! very pretty! i esp like it with the red poppy and purse; her previous pairing with a black purse was sooo safe; this adds some lovely color imo. also, aren't red and black st andrew's colors? i'm not surprised she repeated the dress. she's been married for over a year and has collected enough for us to start seeing repeats. what a sweet speech by william! now i'm keeping my fingers crossed for another unscheduled sighting before sunday since they will be (i expect) in london. I saw a glimpse of a large pearl drop earring in another photo...do you have a picture and idea as to which earrings they were? And thankyou so much for your fabulous blog! Not surprised at all Kate recycled this dress - it's not only beautiful - so what if it's a black-tie event? Michell Obama - US First Lady appeared in a very often recycled dress for her husband's acceptance speech before the world TV networks after his won re-election to the US Presidency on Tues 11-6-12. I think it sends a really strong message that these gowns are suitable to recycle even if both ladies would be easily given clothing to borrow or even keep if worn to certain affairs. It's just not in keeping with the message of this is a rough economic time for most. We saw the Queen Mum and later to been Queen EII wear the same things over and over again in WWII and in years after the war. Not only was fabric rationed but that just was how they needed to put themselves across vs. showing opulence of they society status/access. i wish in the US we would get back to wearing and seeing sold Red Poppy pins in honor of Armistice day which was changed to Veterans Day in the US in my lifetime. I love this dress and would be happy to see her wear it again for a black -tie event next season. Lets not discuss Michelle Obama recycling a dress as 'frugal.' Her extravagant trips to Broadway, Mexico for her daughter, and Hawaii for her family (2 days earlier than the president causing Air Force one to make two trips across the country) cost US tax payers thousands. It is truly insulting. @Anonymous- I so agree. This blog is about the Duchess of Cambridge not Michelle Obama. And futher more she does not hold a candle to the beautiful Duchess. Whoa, THOUSANDS? That must work out to be . . . a fraction of a fraction of a cent per taxpayer! Let's be clear, complaining about the taxpayer costs for a president and his family is pretty much a red herring and used only when people are unhappy with the current president. Liberals complained about President Bush's extensive vacations in Texas, conservatives now complain about the Obamas going to Hawaii. On balance, I doubt any one presidential family costs the taxpayers SIGNIFICANTLY more than the others. And really, at least we elect the person we spend money on . . . the British taxpayers are stuck with paying for a royal family who they have no choice over. I'll pay for the Clintons and Bushes and Obamas, and would have paid for the Romneys, over paying for a hereditary monarchy any day! Okay that's enough American politics on a princess blogs! It is not that you can't criticize them here, but why would you follow this blog if you hate them so much? And I think this is not your first comment ever, so apparently, you do follow The Duchess. I am not angry, or yelling or anything. It is just a thought. Don't take me as a rude person, because that is not what I am trying to be. @ Ana - I think you overreacted to my comment. Where in the world did you see an indication that I "hate them so much" or used "very angry words"? I thought it was very strange that someone attacked the Obamas for using the taxpayers' money on a blog dedicated to following a member of the royal family, who use the British taxpayers money and aren't even elected! I was trying to point out the cognitive dissonance involved in the original poster's POV. And yes, there is a cognitive dissonance in my own view of the royal family. I like following the fashion and the gossip, but I also firmly believe that it is highly unjust and completely un-modern to have any sort of hereditary positions in society, and to have benefits, status, and public funding flow to person just because he or she was born to an HRH. I know the arguments in favor of the royal family (they bring in tax dollars, provide Britain with an indelible link to their history, etc) and I still don't think any of them make up for the fundamental unfairness of the system. Now, I'm not a British taxpayer, so I really have no stake in how the UK chooses to support its royal family, which is why I feel no need to lecture anyone about my republican views on a regular basis. I'm just an outside observer who is fascinated by the clothes, the customs, and by discussing whether or not the members of the BRF are doing enough charity work to repay the public for all of the benefits they have reaped from their position. I am a big believer in the maxim, "To whom much is given, much is expected," so the public debates about the royal family's workload is fascinating to me. Obviously, this particular site is NOT the right forum for extensive debates on Kate's workload, which I think is totally fair, but I do still like coming here to see what charity events Kate is doing. I hope that answers your question and makes you realize that I do not in fact "hate them so much." I have absolutely no ill will towards any individual member of the royal family, I just disagree with the concept of there even BEING a royal family. I was born in a country with a royal family but moved to the United States, so I've had some experience in both kinds of systems. On one final note, I have a small request - I've noticed that you, and a couple of other posters, will on occasion overreact to another poster's criticism of Kate or the BRF generally and question them about "why they even follow the blog." I honestly don't think that sort of questioning is very productive and it does come across as a bit rude. All of the posters are here for a reason, and as long as they're not trolling or sidelining discussions with irrelevant rants, why not leave it to Charlotte to moderate who can and cannot post? I know you did not intend to be rude, but the underlying message of your question basically comes across as, "this blog is only for people who approve of Kate and the BRF, no one else is welcome." So, my request to you is that you think about how that question might come across the next time you want to question why a poster participates in the comments. I appreciate the respectful tone of your first post and hope you realize that I am not an angry "hater," I just have a different opinion than you. I'm still not a big fan of the dress. It fits her well, but it just doesn't excite me. I do like that she matched the clutch to the poppy brooch. I would have loved to see something new - was kind of looking forward to it, actually. BUT I absolutely LOVE this dress! I remember the first time I saw it in the pictures of the War Horse premier and I thought it was the most beautiful dress. It looked wonderful tonight with the addition of the red poppy and clutch. And that beautiful, shiny hair! Definitely a stunning look tonight for Kate. Oh I wish she would start doing something a little more mature with her hair! The long hair hanging in her face seems very informal considering her dress and the event. And the dress and the event both look wonderful! Maybe she just enjoys wearing a dress she really likes more than once. I know I do. I have always liked this dress. I have a thing for lace seems very feminine and romantic. Love the poppy but the clutch could have been a slight deeper scarlet red. In my opinion blah blah. Yeh I would like to see her hair up but just give her time and her taste and style will change. Or maybe not. Hope you are better Charlotte. Great blog thanks for all your work. Does anyone know how Kate attached such a large pin/brooch to her dress without tearing or stretching the lace? Love that she recyle everything from thev gown ... im not complaining with her recyle process nowdays in crisis well its nice too see william and kate back when they fall inlove at the first time. I am not a fan of this gown - I don't like lace very much - but the recicling shows that Kate is a very sensible woman. The poppy and the red clutch added a fantastic touch of color to the ensemble. But let's move on, and wait for Remembrance Day! Unfortunately I am nearer to eighty than thirty---but I can still wish! Please stop criticising her. You talk as if she's come out wearing rollers! As if the Queen would be a. So familiar b. so rude as to presume to dictate the style in which she wears her hair! I almost think if she parted her hair a little to the side it would prevent her from looking slightly dowdy. If I recall correctly her hair at the ARK gala was a little more breezy and shifted to one side. I can't wait to see the dress from the ARK gala and the Team GB events again, but since those were summer events I'm guessing it will be awhile before we see them resurface. However the white long sleeved high slit gown from the private event several months ago could reappear sooner (hopefully with her hair up this time!). Because Kate does so few appearances, think we're all disappointed by recycling even though we agree it's wise. Diana did so many more appearances that it was far less disappointing when she wore the same dress. Also a shame she so often recycles at home in UK and saves new clothes for abroad. Makes home appearances seem a bit "second best"
I also wish she wouldn't wear black. It's really not the best color for her and she has many, many years ahead of her for black! heard about an event on decmeber 9th, am i correct? I love the dress!!! I think it is very beautiful and romantic. As much as I am sure we would all like to see a new dress, I think it is wise to recycle. I would have loved seeing her hair in an updo, but it still looked pretty. The red purse and poppy were perfect! Catherine looks beautiful, happy, and relaxed. I love that William included how important their friendship was in his speech. It shows how much he truly loves her and that they are a team. I would think that it gives the Queen a hope after so many failed marriages that the future of the monarchy looks bright. William chose a jewel when he chose Catherine! Charlotte, you did an amazing job on the post (as usual) and am so thankful for your time and energy you put into it. I am hoping we might have a sighting before Remembrance Day on Sunday, but if not, I look forward to another wonderful post then!!! What is the British Military Tournament you have the Duke and Duchess listed as attending today 9/11? Just wondered if it is the Festival of Remembrance on Saturday at the Albert Hall. I'm delighted that she recycles. The 1980s were a different time economically and people had no problem with Diana wearing a new ensemble every time she was seen in public. The times have changed and even though the Windsors will never be hurting for funds, millions of Britons and people around the world are having economic difficulties. That matters and the Queen is extremely aware of public perception and how everything plays in the public. These dresses cost thousands of dollars each, what is she supposed to do once she's worn them? Throw them out? Also, people tend to be a bit more tolerant of the expensive vacations to the exclusive locations when they see the royals are at least trying to do their share. Also, I think we all keep forgetting that Kate (and Will) are not next in line for the throne. They're second following Prince Charles. Diana wardrobe was amazing but she did recycle. Some of her gowns were altered and even a maternity outfit or two was altered so she could wear it after her pregnancies. And I agree with the hair comments. Even if she prefers it down, a demi-chignon or something similar would be nice and refreshing to see. Starting to get a bit tired of seeing the same hair every single time. I have enormous respect for Michelle Obama, she is no doubt an inspirational woman but this isn't the place to discuss her or compare her to Kate. There is a wonderful blog about Michelle called Mrs.O you can check out for all thing related to the First Lady. There is indeed an event on December 9. William and Kate will attend the British Military Tournament. I will be including information on the event in tomorrows post. I've also heard the Cambridges have a black tie event around the 24th. In other news, William and Kate attended a meeting for their Charities Forum yesterday, no pictures are likely to be released though. I absolutely love this dress and she looks gorgeous in it, but her hair is taking over her head. Yes, she does have lovely hair, but it looks like she could use a trim and some layering around her face to lighten it up a little...it's just too overpowering. stores carry Wayne Dalton parts and doors so they would have additional resources for you.